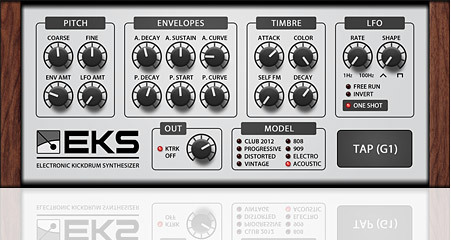 The plugin offers six high-quality sound models, a mix of vintage hardware emulations, and new, modern kick drum sound models, designed for your next club hit. Despite their fundamentally different nature, all models respond to the sound parameters in largely the same way. The user interface is organized into four sections controlling the pitch, the amplitude and pitch envelopes and its curvature, the attack stage and finally pitch modulation. This layout makes it simple and straightforward to program your own patches or modify existing ones. The PDF manual included provides detailed information about every parameter.